I’m lying in bed, before sunrise, looking at the trees. Not a tremor, not a shiver, not a flutter. An hour later the sun’s shining, the sky’s blue, the world’s a happy place – and did I say, it’s Monday? Not my favourite day, but this one? So far the auguries are good. I dress with a little more care than usual. Find an old velvet jacket in the cupboard. It’s the kind of event you don’t have to dress up for, but it’s special and the velvet makes me feel I’ve done my bit. Southport, my destination, is a place of contrasts. I suppose all once-grand British seaside resorts have suffered similar fates. But here, perhaps, the contrasts have more jagged edges. The elegance of Lord Street, its shops and civic buildings, jarring with the bland, insipid boxes by the seafront – a cinema, fast food and big, bargain shops. Napoleon (the third of that name) once lived in Southport. It was wide, leafy Lord Street that inspired him – we are told – to design the boulevards of Paris. I doubt he’d recreate her seafront architecture in any place he cared about today. But it has a pretty pier, worth a walk, or a ride, to visit the penny arcade in the glassy new café. Today, though, I’m on my way to Lord Street. Not the filigree-ironwork-shaded shop-side, but the grand, public building side. The venue is The Atkinson, a newly refurbished council building housing a gallery, library and ‘performance spaces’. I’m waiting in the café for my friend Norma. Not named after Bellini’s operatic heroine – though she does sing in a choir. And arrives resplendent in a dramatic shade of purple. Hunger has flipped the sensible switch in my head. My knife’s just breached the crust of a rather beautiful pork pie, topped with apricots, when Ron, Becca, Tom and Dominic – the reason we’re here – arrive. It’s an unusual combination of instruments. At least I think it is. Becca – the other Abramski, is a bassoonist, Tom (a Verity, not an Abramski) plays the clarinet. And Becca, I have discovered, has a hidden talent. She’s a bit of an engineer. In her office, it looks as if gnomes have been at work. 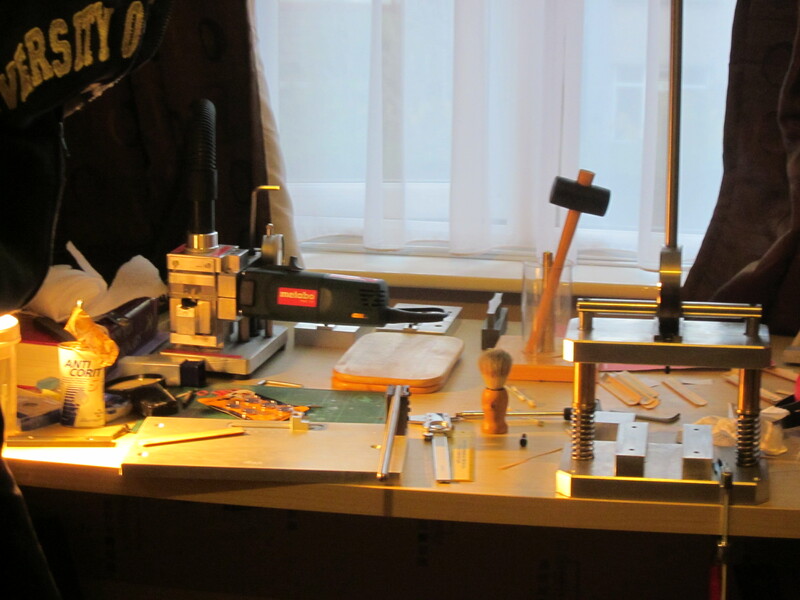 Bespoke engineering equipment, on a miniature scale, sits on most available surfaces. 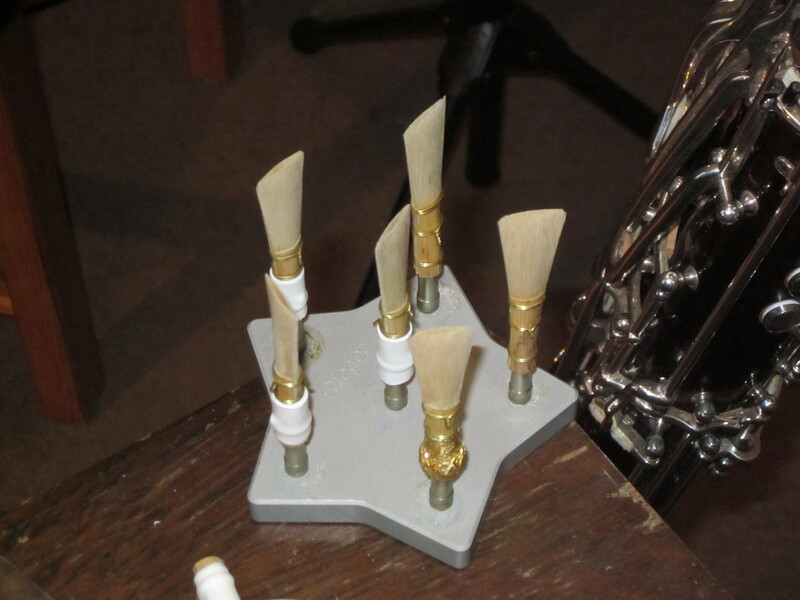 All designed to help her make the best ‘reeds’ for her bassoon. 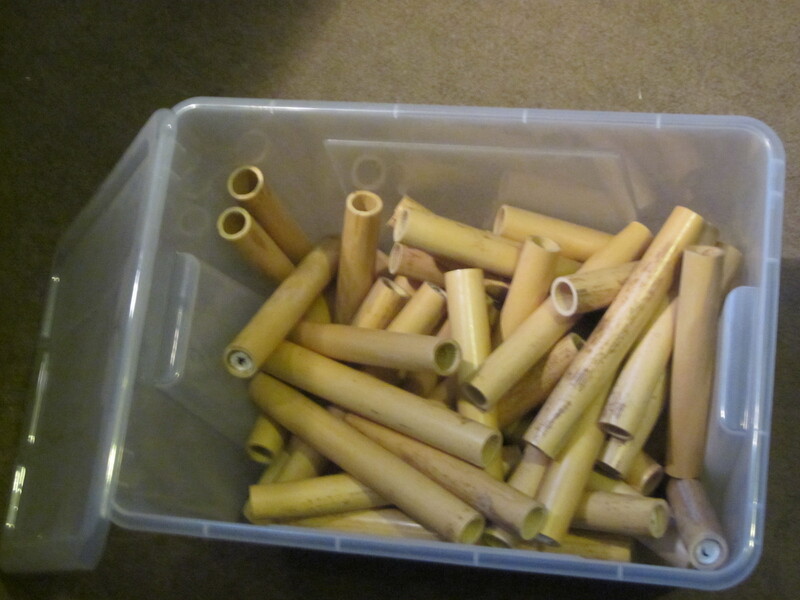 Except – they’re not reeds. Shelves line the wall, stacked with plastic boxes full of honey-coloured tubes waiting to be split, honed and turned inside out. And it’s these little engineered components that enable her to create the sublime, chocolatey tones we’re hearing today. Rich, Swiss, milk chocolatey tones. But the music’s not Swiss. We’re hearing a four-part trio (in G Minor) by a British man called Hurlstone, who died before he’d found enough fame to make it a familiar name. One part of the work was lost. Hence the ‘trio’. Now it’s found, there’s a rumour that it vanished because the piano part was so difficult to play. It’s hard to take your eyes off them as they race across the keys. But my eyes flit from musician to musician. It’s like French skipping – you know, where two people turn a rope in each hand and the skipper has to jump between them as they interact. Nothing happens without all of them working together, to time and in concert. But what about the dumplings? That’s what you really want to know, isn’t it? Well, that’s down to Mendelssohn. Tom, in whose hands the clarinet brings forth notes that dance like a young tree in the wind, tells us how Mendelssohn’s love of dumplings inspired the piece we’re about to hear. The composer knew two clarinettists, a father and son by the name of Baermann. Like Becca, they had a hidden talent. They were master dumpling makers. Dumplings flipped the sensible switch in Mendelssohn’s head. He swapped Concert Piece No 2 in D Minor for a fine – we hope – batch of dumplings. And, how’s this for a coincidence? Becca’s not the only Abramski with a hidden talent. Ron’s chicken soup with dumplings is, or so he claims, the best. Appropriate for a lunchtime concert, all this talk of food. But the music is what we’re here for, and it doesn’t disappoint. Three unfamiliar (to me) enjoyable works. An appreciative crowd of people – and still no rain. This entry was posted in Art, jaunts & going out and tagged bassoon, clarinet, Hurlstone, Lord Street, Mendelssohn, Napoleon III, Paris, piano, Rebekah Abramski, Ron Abramski, The Atkinson, Tom Verity. Bookmark the permalink.